Home » Straight Pool Shootout! Come Join us for Massé’s first straight pool tournament!Straight pool, also called 14.1, was the common sport of championship competition until it was overtaken by faster-playing games like 9 Ball, 8 Ball and, 10 Ball. Players like Willie Mosconi made it look easy! Mosconi set the world record by running 526 consecutive balls without a miss during a straight pool exhibition in Springfield, Ohio on March 19–20, 1954. To this day the record has not been toppled and many speculate it may never be bested. We’re going to kick off 2019 with Massé’s first Straight Pool Tournament. 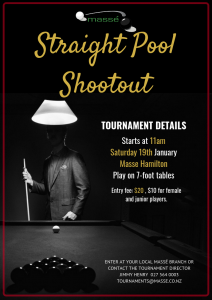 The Straight Pool Shootout will take place at Massé Hamilton on Saturday 19th January. Read up on the rules and get ready for an awesome tournament!